Indian names: darhaldi (Bengal), kashmoi (Garhwal), rasont, kashmal (Himachal Pradesh), chitra, dar-hald, rasaut, kashmal (Hindi), maradarisina, maramanjal, (Kerala), daruhald(Maharashtra), chitra, chutro (Nepal),chitra, kasmal. simlu, sumlu (Punjab) mullukala, usikkala (Tamil Nadu), daruharidra, darvi, kata, pitadaru, suvarnavarna (Sanskrit). Kashmal is an erect spinous shrub, often found in small patches on the bill slopes. It is one of very important medicinal plants. Almost every part of this plant has some medicinal value. Its roots, stem, bark and fruits are used in many ayurvedic preparations. 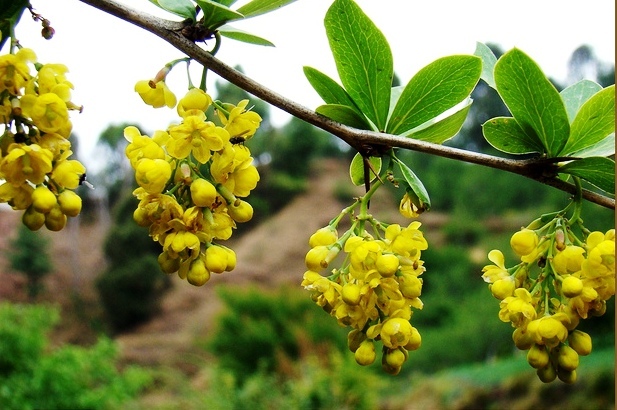 This shrub is found growing wild in the sub-Himalayan tract at altitude ranging from 850-2,500 metres. It also grows in the Nilgiris and in Ceylon. An erect spiny shrub, ranging between 2 and 3 metres in height wood, hard and yellow; bark, yellow to brown from outside and deep yellow from inside, removable in longitudinal strips by hand; spines (which, in fact, are modified leaves), three-branched and 1.5 cm long. Leaves, in tufts of 5 to 8, phyllotaxy verticillate, lanceolate, simple spiny, toothed, leathery, sessile, acuminate, with reticulate pinnate venation, 4.9 cm. long, 1.8 cm. broad, deep green on the dorsal surface and light green on the ventral surface. Flowers, stalked, yellow, complete, hermaphrodite, cyclic, actinomorphic, perigynous, the average diameter of a fully opened flower being 12.5 mm; inflorescence, a simple to corymbose raceme, with 11 to 16 flowers per cluster; calyx, yellow, polysepalous, with 6 sepals (3 small, 3 large), yellow, actinomorphic caducous, 4 to 5 mm long; corolla, polypetalous, with 6 petals, yellow, actinomorphic, 4 to 5 mm long; androecium, polyandrous, with 6 stamens, adnate, 5 to 6 mm long; gynoecium, one, 4 to 5 mm long, with a short style and a broad stigma. Fruits, globose to ovoid, usually covered with bloom as in plums, 7 mm long, 4 mm in diameter, weighing 227 mg, 237 microlitres in volume; fruit colour, aconite violet 937; colour of pulp and juice, plum purple 934/3. Seeds, 2 to 5, varying in colour from yellow to pink, each weighing 25 mg and being 29 microlitres in volume. Flowering in Berberis aristata DC. starts from the first fortnight of March and remains in progress up to the end of April. The peak flowering season under Solan conditions was recorded to be from 8-25 April. The fruits start ripening from the second week of May and continue to do so throughout June. They can be retained on the shrub after ripening for quite a long period, but they fall off soon after the onset of rains. The fruiting season, therefore, ends abruptly with the commencement of the rainy season. An average-sized bush of Berberis aristata DC. was found to yield 657 g of fruits in about 4 pickings. The extractable juice of the fruit is 26.6 per cent. The fruit contains 63.4 per cent moisture. The total soluble solids of the juice amount to 18.90 per cent, having 1.07 per cent acidity, 11.97 per cent total sugars, most of which are in the from of reducing sugars. The fruit contains 0.64 per cent tannins and 0.37 per cent pectin. Its vitamin C content is only 4.60 mg per 100 ml of juice. The protein content of the fruit is 2.31 per cent. Its total mineral content, as represented by ash, is 2.052 per cent. In the fruit, the percentage of different mineral elements, viz. phosphorus, potassium, calcium, magnesium and iron are 0.079, 0.439, 0.065, 0.061 and 0.011 respectively. The fruits of kashmal are given as a cooling laxative to children. The stem is said to be diaphoretic and laxative and useful in rheumatism. The dried extract of the roots is used as an application in ophthalmia. It is also an excellent medication in the case of sun-blindness The bark of its root is a valuable medicine in intermittent and remittent fevers. The root is one of the few really good medicines in India. In its efficacy, it is almost equal to quinine and Warburg’s tincture. It does not produce any bad effects on the stomach, the bowels, the brain and the organs of hearing. A very valuable preparation called rasaut is prepared from this plant. For preparing rasaut, the bark of the root and of the lower part of the stem is boiled in water, strained and evaporated till a semi-solid mass (rasaut) is obtained. Rasaut is fairly soluble in water. It is mixed with butter and alum, or with opium and lime-juice and is applied externally to the eyelids to cure ophthalmia and other eye diseases (Jain, 1968). It is also reported to be a mild laxative, a tonic and is useful in curing ulcers and fevers. The chief constituent of kashmal. is berberine, which is a bitter alkaloid. 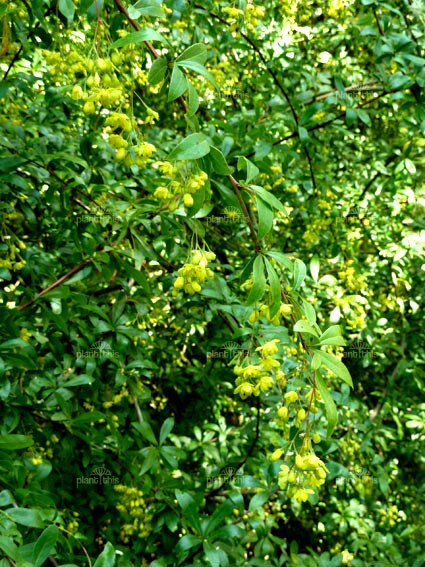 Rasaut is used as a purgative for children and as a blood-purifier, a tonic and a febrifuge. It is also given in diarrhea, jaundice and skin diseases. A watery solution of this preparation is also used for washing piles, Oriental sores and glandular swellings. The small fruits with their seeds are sweet, with a blend of acid. They are slightly bitter and the bitterness is due to the seeds. The taste and flavour of the fruits is good. 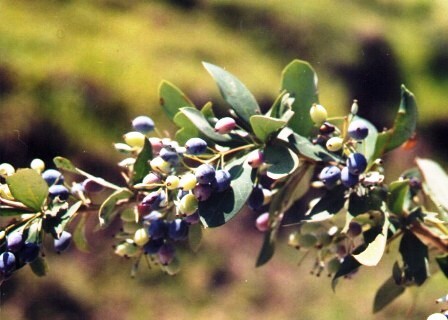 The fruits of kashmal are eaten by the villagers in the hills. They are also offered for sale at some places, mostly near schools, because they are very much liked by children. Even sun-dried fruits are eaten, being quite palatable. The fruits are juicy and contain plenty of sugars and other useful constituents. Efforts should, therefore, be made to develop some products out of this wild fruit. Kashmal is a very important plant from the medicinal point of view. Its stem, roots and fruits are used in many ayurvedic preparations. Rasaut is one of the very important and useful preparations obtained from this plant and is used in curing many human ailments. The roots of this plant are also used for making an alcoholic drink by the villagers in the hills. This plant is also an important source of dye and tannin and is used for dyeing clothes and for tanning leather. According to Watt (1889), it is perhaps one of the best tanning dyes available in India.